Feb 2015: We have re-designed and updated the Lambeth Hate Crime Reporting Cards which we are now circulating across Lambeth. The front of the cards are yellow and clearly state “Lambeth Hate Crime Reporting Card” as this is how we want people to refer to the cards. (1) In an emergency always call the Police on 999 is the first option because in an emergency the police are the best placed to respond. Non-emergencies can be reported to the Police via 101 this again is the preferable option as the Police will carry out any investigations. 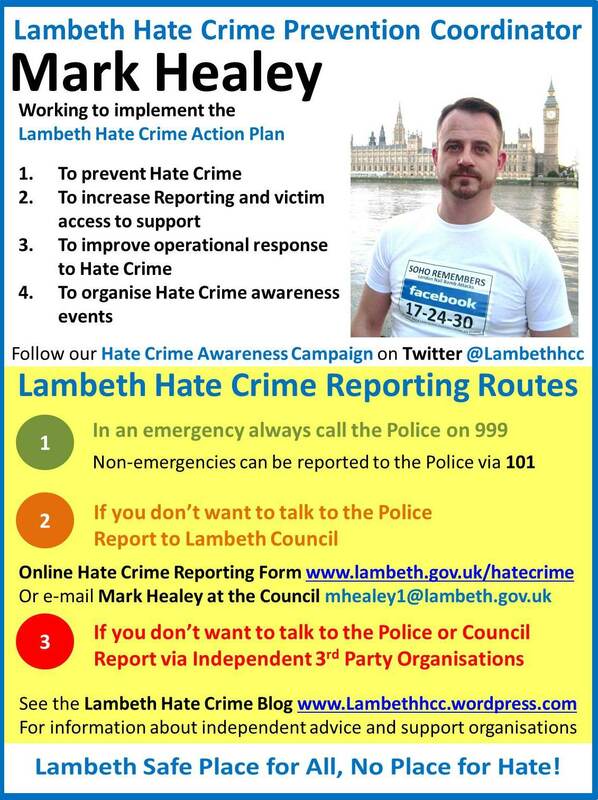 (2) If you don’t want to talk to the Police Report to Lambeth Council is the secondary option – we provide two options (a) Online Hate Crime Reporting Form http://www.lambeth.gov.uk/hatecrime and (b) Or e-mail Mark Healey at the council mhealey1@lambeth.gov.uk. 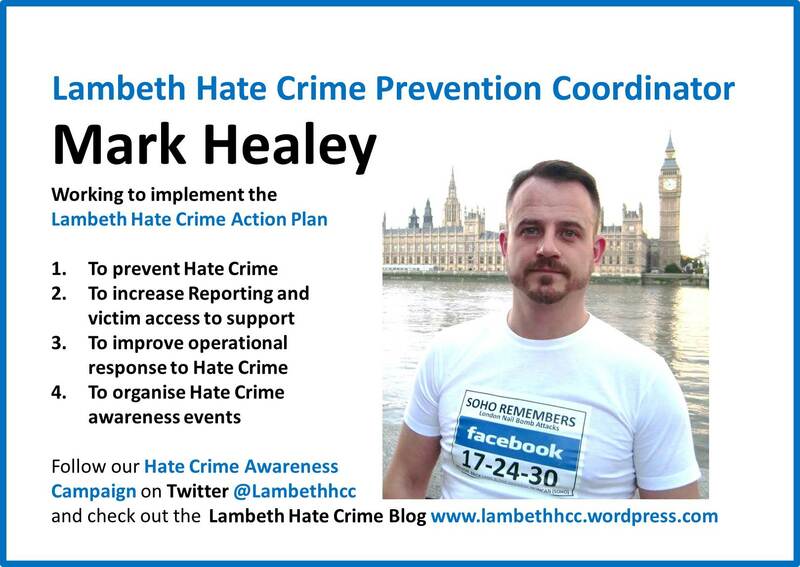 Mark Healey Lambeth’s Hate Crime Prevention Coordinator will receive these reports and then after consulting with the person making the report decide the best course of action to take depending upon the outcome the victim is seeking. This will be either referral to the Police for investigation and/or referral to specialist advice and support organisations if desired. In some cases – where reports are made anonymously no further action will be taken however the reports will help increase the police and council’s awareness of hate crime incidents/offences taking place and enable us to allocate resources to hopefully prevent or reduce further incidents/offences from taking place. (3) If you don’t want to talk to the Police or the Council Report via independent 3rd Party organisations. See the Lambeth Hate Crime Blog http://www.lambethhcc.wordpress.com For information about independent advice and support organisations. This third reporting route option is to guide those who don’t want to deal with the police or council to the Lambeth Hate Crime Blog where they will find information about the various independent 3rd party advice and support organisations that are available to help them. The independent 3rd party organisations will then work with the reporter/victim of hate crime and help them decide what they want to do – whether that is to pursue an investigation in liaison with the police, to assist with access to advice and support services or to anonymously pass on the report to increase the police and council’s awareness of hate crime incidents/offences. We finish with the Lambeth Hate Crime Awareness Campaign slogan Lambeth Safer place for All, No Place for hate. The other side of the card is white and includes a picture of Mark Healey, Lambeth’s Hate Crime Prevention Coordinator. (1) To prevent hate crime. (2) To increase reporting and victim access to support. (3) To improve operational response to hate crime. (4) To organise Hate Crime Awareness events. It guides people to Follow our Hate Crime Awareness Campaign on Twitter @Lambethhcc and check out the Lambeth Hate Crime Blog http://www.lambethhcc.wordpress.com We want people to follow our twitter profile and the Lambeth Hate Crime Blog so that we can keep them informed as the Lambeth hate Crime Awareness Campaign progresses. Thanks to the 17-24-30 No To Hate Crime Campaign for sponsoring these cards. This entry was posted in Disability, Faith, Gender Identity, Other Hate Crimes, Race, Sexual Orientation and tagged Advice, Disability, Faith, Gender Identity, Hate Crime, Independent, Lambeth, Lambeth Hate Crime Awareness Calendar, lambeth hate crime reporting cards, Lambeth on-line hate crime form, Mark Healey, MPS, online hate crime form, Police, Race, Sexual Orientation, support, Third party Reporting sites. Bookmark the permalink.